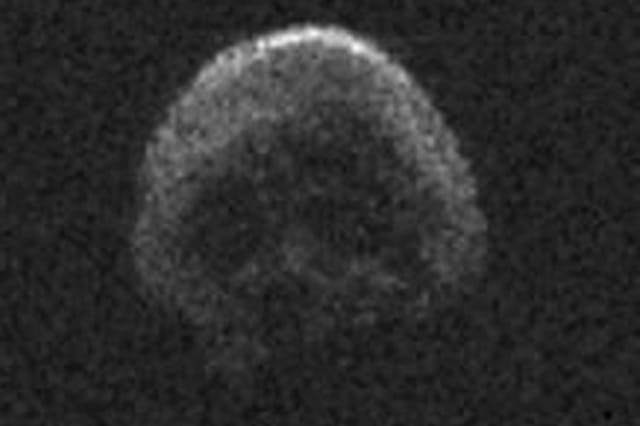 A huge asteroid resembling a skull will pass planet Earth on Halloween, NASA astronomers have said. 2015 TB145 was discovered by scientists earlier in October and will be the closest flyby of its kind until 2027. It will fly past Earth at around 5pm GMT. The asteroid, which NASA called a "Great Pumpkin", will fly past Earth safely at a range of about 300,000 miles (about 1.3 times the distance between the Earth and the moon), according to Space.com. It is larger than expected at 600m wide and is rotating every five hours. There are signs to suggest the asteroid, which is speeding through space at 78,293 mph, may be a comet. Paul Chodas, at NASA's Jet Propulsion Laboratory, told Sky News: "Well, let's be clear, this asteroid will pass safely by the Earth. "It's not going to hit us and we will know its orbit really well so we can project it into the future and see whether or not it comes near the Earth again and we've done that and it's not going to pose any hazard to the Earth in certainly the next century."